We have implemented custom projects with Apache Hadoop ecosystem. We have experience in building customized data analytics solutions with Python and R.
We have a strong research background and work with a highly experienced academic research team. Our experience in safety-critical embedded systems will gurantee a successfull and on-time project delivery. We can assist you in choosing the right technology and hardware platform for your product. We are still in the ERA where specialised standalone software is needed. We are here to help you develop your desktop and mobile applications. 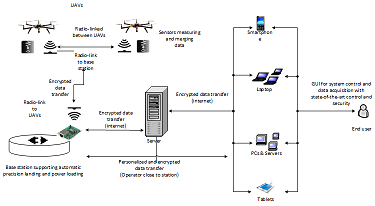 We are working on a fully automated, self-recharging drone, which can be used in Security inspection, Object detection, Border patrol, Crops inspection, etc. Dronomy started with strong emphasys in real-time and safety critical systems. We have brought this culture of efficiency and on-time delivery in the field of data analysis and market research to build high quality solutions to our customers. Our primary goal has always been the delivery of reliable and productive software and research results. None of this would be possible without the dedication and great expertise of our team of developers and researchers. Especially when it comes to solving tough problems, fussion of academic and industry professionals can bring spectacular new ideas. With that kind of solid backup we can always Fly Brave! We have built multiple BigData analytics solutions with Apache Hadoop. Using parallel processing and advanced machine learning it has been possible to apply scientific research methods to real world problems. While taking advantage of Apache MLib and Mahout we have also created a number of customized solutions with Python and R.
Dronomy has started as R&D focused company and we still keep it going that way. Our data analytics solutions combine state-of-the-art methods and algorithms with highly efficient and optimized implementation in Python and R. Team members are encouraged to publish their results in a high ranked research journals indexed in renowned scientific databases. It is our firm belief that only through use of academic research and industry experience excellence could be achieved. Dronomy Ltd. has been granted by The Patent Office of Republic of Bulgaria a patent #2863 (Application #3864) – "INTEGRATED SYSTEM FOR CONTROL OF UAVs [in Bulgarian "ИНТЕГРИРАНА СИСТЕМА ЗА УПРАВЛЕНИЕ РАБОТАТА НА АВТОНОМНИ БЕЗПИЛОТНИ ЛЕТАТЕЛНИ АПАРАТИ"]". Patent classes are B64C 39/02, G05D 1/10. Detailed information on the project can be found here. 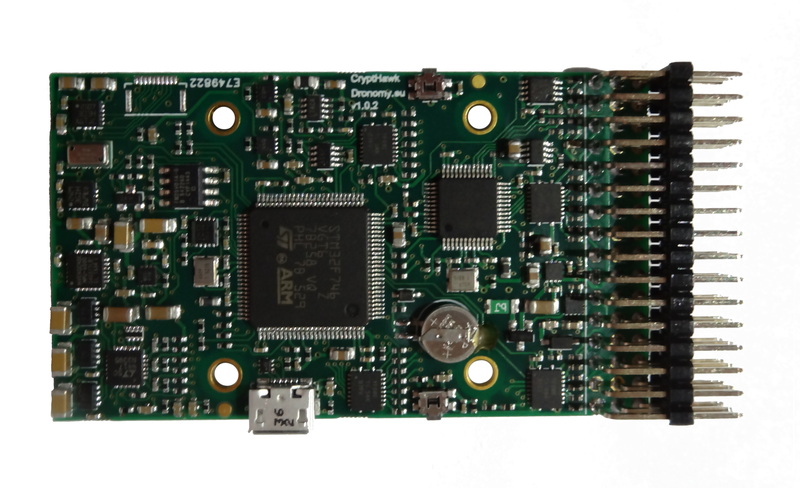 CryptHawk builds on this legacy by providing a more powerful Cortex-M7 hardware and by implementing important updates that would allow building a truly commercial grade autopilot systems. Detailed information on the project can be found here. CryptHawk in action, mounted on 3DR Y6 frame can be seen here (~15MB in lower resolution) or here (~440MB in high resolution). VK-RZ/A1H board offers a very flexible and powerful combination of software and hardware options. We have worked on Linux support for it, including automated build scripts, enhancement of the BSP and improvement of the power mode handling. Detailed information on the project can be found here, including build instructions and sources.